Applications: For mounting polishing mop wheels with soft centres of approx 10-13mm diameter. Also ideal for lap moips. 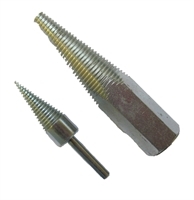 One is for fixed spindle machines with an M14 threaded end. We also have a spindle mounted option for drill chucks. Product Notes: The fixed spindle machine version has an M14 female fixing and fits to shaft spindles usually on machines sold as polishers or grinder/polishers. The spindle mounted version is for drill chucks and possibly low speed air-tool collets. We recommended small diameter only are used on the spindle mounted version, perhaps up to 75mm, max 100mm.